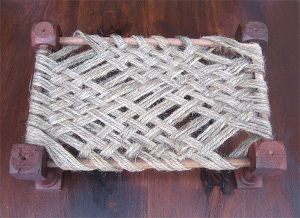 Charpai is a common Indian bedstead that is hand woven on a wooden frame, the word comes from two Hindi words, char meaning 'four' and pai meaning 'legs'; a bed that is a common furniture in most Indian homes. Charpai is a common Indian bedstead that is hand woven on a wooden frame, the word comes from two Hindi words, char meaning 'four' and pai meaning 'legs'; a bed that is a common furniture in most Indian homes. This charpai on the other hand, is a miniature version of it made from same material as any other regular charpai, i.e. jute and wood. Not only will it look great as a display item in your house but can turn out to be a unique jewelry holder. It measures approximately 10” x 6” and is 3.5" in hieght.